was how a conversation I had with a student today started out. She wandered toward me and said that as I was walking around returning quizzes today. Then she said, “Mrs. F, you’ve lost a lot of weight since school started.” and gave me a look that says you’re not dying are you? I laughed a little and then we had a conversation about how I had been losing weight, what my surgeon did to help me. And of course I brought biology into the conversation since that is what I teach. She asked me if I had a band put in, and I explained that I had not, and described why the surgery I had worked to help me so far. We talked about ghrelin, and volume reduction and how I have to prioritize what I eat for maximum effect. She was very interested and fascinated that someone could survive with only 20% of a stomach. Then the bell rang and I dismissed the kids for the weekend. This was the first time any of my students had said anything to me about my weight loss. Not that I am seeking their approval or anything, but I’ve been asked on several occasions by other folks if my students had ever said anything to me about it. Until today, none of them had. And it’s not like I talk about it all the time in class, so when it does come up, I usually use it as a teaching opportunity. My colleagues are more likely to comment and ask about my weight loss than my students. In fact, this week alone, I’ve had several of the folks I work with tell me that I am becoming unrecognizable. Part of the reason they say this is that I rarely see them. The campus I teach on is really large, as is the size of our staff–we have over 400 teachers, and we don’t see one another all that often. I’m curious to see what will happen when June rolls around, when hopefully I’ll have hit my surgeon’s goal by then. I’d like to hit it before my 1-year surgery anniversary. I find that lately I’m revising my goals to make them more realistic based on how things have gone for the past 3 weeks. I don’t like feeling like I’m lowering the bar, but my body isn’t cooperating with my best efforts to whittle it down to a healthy weight at the moment. Setting goals to get to specific weights by certain times simply isn’t realistic. That’s a hard thing to swallow, and an even harder thing to tell Thinner Girl, who is really excited that 137 pounds are gone so far and that there are 90 more to go. But like I said earlier in the week, I’m trudging on, doing what I’ve been doing and hoping that this stall I seem to be in will break soon lest I lose my freakin’ mind. Today’s eating was pretty good: 90 grams protein, 44 carbs, 41 fat, 980 calories. I also went to the gym and attempted a 45 minute recumbent bike ride, but was stopped 33 minutes in by a calf cramp. I did manage to get in 5.41 miles at 10 miles per hour, which is the fastest I’ve ridden so far. I’ll give it a try again tomorrow–this time I’ll be sure to hydrate properly BEFORE I ride, not during! 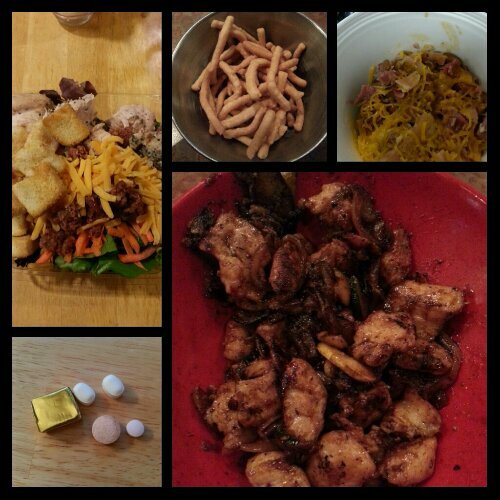 Today’s food choices, from upper right: ham, beans, cheese and egg breakfast bowl from Rudy’s; chicken zucchini bowl; multivitamin and calcium supplements x2, iron and B12 supplements; leftover salad from last night’s dinner (no chicken, no croutons); crunchy noodle things. Not shown: spicy taco stew meat, a saltine cracker and half a cup of low fat, high protein chocolate milk. This entry was posted in daily bites, eating, la guerra, little things, NSV's, post-op, success, the little things, the sleeve, vsg, weight loss surgery and tagged daily bites, eating, exercise, la guerra, let me teach you, NSVs, post-op eating, post-op life, reactions to WLS, sleeve gastrectomy, sorry for sleeve rocking, success, the little things, things of win and awesome, VSG, vsg realness, WLS, workin' on my fitness. Bookmark the permalink.